If you are looking to make your next home renovation job quick and easy, tile flooring from our store is the option of choice. A tile floor adds an elegant and stylish feeling to any space, adding appeal and value to your home while still holding up under the heavy foot traffic and spills that come with daily life. Our flooring showroom has a huge selection of different tiles to suit anyone’s aesthetic needs, as well as expert contractors that provide long-lasting tile flooring installation services. If you want to ensure that you get the best deals on name-brand tile that is perfectly installed to your specifications, we are the store to trust. Come by our showroom today to find out more about the excellent deals we have on some of the best flooring products that the industry has to offer. No matter what type of tile you desire, we are the showroom that has come to be known for carrying a tremendous variety of tile. Not only that, but we offer all of our services with a friendly smile and superior customer service. Even if you don’t know exactly what type of flooring you need to suit your lifestyle, our team of friendly sales associates are here to help you in whatever ways they can. We have on staff a team of design experts who can help you not only determine the best style of tile flooring for your personal tastes, but also which type is going to be most well-suited to your household. Our design team is determined to match you with the best flooring for your particular needs. There are a few different materials that a tile floor is made out of, each with its own specific uses. For instance, ceramic tile is unmatched in its durability and resistance to stains and spills, making it perfect for kitchens, laundry rooms, bathrooms, and any other space that seems a lot of water usage. We recommend this type of tile to homes that have children or pets, as it is capable of holding up to whatever daily activities take place in your home. With a simple wipe, whatever liquids are dropped on it are completely erased from the surface without leaving behind a stain. 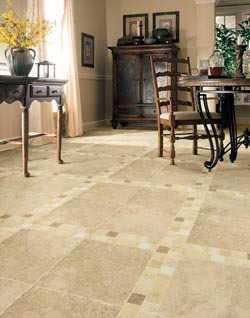 Porcelain tile, while also nearly as durable, is the choice for those that want a more elegant look for their home. Capable of resembling traditional kitchen-style tiling and flat, stone floors alike, porcelain tile flooring brings a touch of class to any space you put it in. After selecting your tile floors, our expert installers will lay your new floor for you. In addition, if you are not happy with your four-star or five-star floor within the first 30 days of installation, we’ll replace it. If you ever have any problem with the installation in the future, we'll make it right at our expense. The final step in the process of securing perfect flooring for your home is the installation. Don’t trust your home to just any contractor. Instead, rely on us to supply you with the team of experts you need to make sure that your investment is protected and that your tile floor installation looks great and lasts long. Contact us for a free consultation to find out which type of tile flooring I best for your home. We proudly serve customers in Hammonton, Cape May, Vineland, Ocean City, and Atlantic City, New Jersey, and the surrounding areas.